Questions submitted by end users from the front-end area are displayed in knowledge base software in the form of Tickets. You can either reply back to them with an answer and/or publish that question as an article to the knowledge base so that in future, other users need not ask the same question again. Editors or super users can view and manage tickets either from dashboard shortcut as explained in Admin Dashboard section or from Tickets section in left navigation bar. Open Tickets: When a user submits a question, by default it is set as an open ticket that needs the attention of admin user. These tickets can be replied back or published to knowledge base so that other users can view them. Notification of open tickets count is displayed in the header section of admin panel which can be expanded to see the quick view of tickets. Refer Admin Control Panel Interface article for more details. Closed Tickets: When questions do not require the attention of admin user, they are marked as closed by admin users. While replying with an answer, there is a checkbox named ’close this ticket after reply’ which admin user can check to mark the ticket as closed. Unread Replies: When a user counter-reply on any ticket from the front end then that reply will be displayed under Unread Replies section. 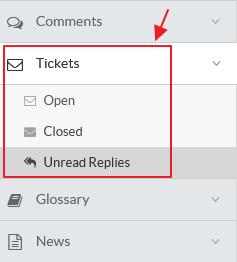 All these replies on tickets will be listed in this section until the admin user view them. Refer Managing Support Tickets article for more details.